If you have thick hair, it can be impossible to get it under control. If you want the latest styles but haven’t been able to find a styling product that can tame your mop top, we know just what you need. The best pomade for thick hair! We did the research to find out which ones made the cut. Before we get started, let’s take a look at some of the key features you need to know. Finish: There are generally 2 options when it comes to finish: shiny and matte. Matte looks a little more natural while shiny adds a bit of oomph. Not sure which one you want? We also found one that’s semi-matte, which is a middle ground. Hold: These pomades come in one of 3 strengths: medium, strong, and firm. Medium gives you the most movement while firm is, well, firm. Strong will keep your hair in shape but can usually be adapted easily by reshaping throughout the day. Scented: The products we chose are primarily made of natural ingredients so each one does have an odor. That said, no scents were added. If there is one, it’s a natural side effect of the chosen ingredients. Water-Based: Water-based pomades are great because they don’t add any oils to your scalp that can cause blocked pores. Plus, you can wash them away using only water, saving your hard from harsh cleansers and shampoos. Clear: There’s a nice mix of clear and opaque pomades. Clear ones are nice because you don’t have to worry about blending them in as much but some of the opaque ones have a lot to offer. 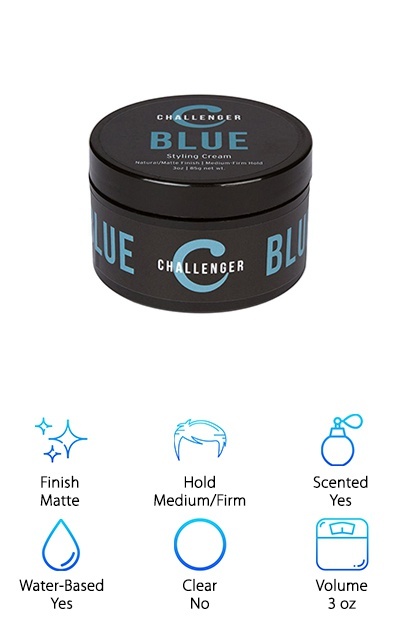 Volume: These pomades come in tubs that range from 2 to 5 ounces. Bear in mind that you aren’t going to need a lot of product to get the look you’re going for. A little goes a long way and even 2-ounce bottles will last for a while. Now that you know what to look for when shopping for the best pomade for thick hair, we can jump right into our pomade review. If you’re short on time, make sure you check out our top and budget picks first. They’re right at the top of the list and a good indicator of what’s out there. Read on to find out about the rest of the awesome products that round out our list. 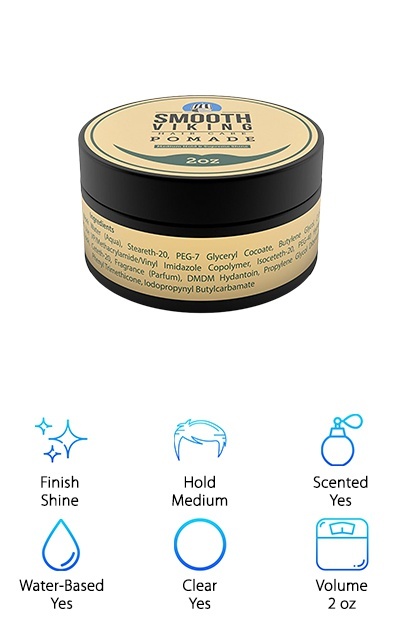 If you want the best water based pomade, Smooth Viking is it. No matter what texture your hair is, this pomade will give you just the control you need to get a sleek look. All you have to do is use a small amount and comb it through your hair to get the desired style and it will last all day. We also really liked that you can get 2 looks with this. If you want your hair to have a matte finish, put the pomade in when it’s dry. Want a shiny look? Use it when your hair is wet. Something else we really liked about it was how easily it washed out. It didn’t leave behind any residue! And get this: they’ll give you a complete refund if you’re not happy with their product. 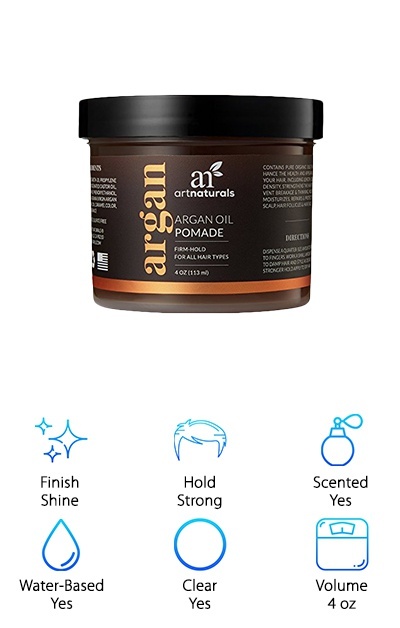 Something that set ArtNaturals Argan Oil Pomade apart from the rest of the items we reviewed is that it has virgin Argan oil in it. You might be wondering what argan oil does and why it’s good in hair products. Well, it’s been used for centuries as a way to promote the growth of healthy hair. It also brings dull, boring hair back to life by bringing back its luster and shine. This pomade won’t make your hair greasy or stiff and provides a flexible, strong hold. Argan oil comes from the nuts of the Argan tree, which are harvested in Morocco then cold pressed to get the oil out. Get this: the oil is packed with Vitamin E which is one reason why is has such a restoring effect on your hair. 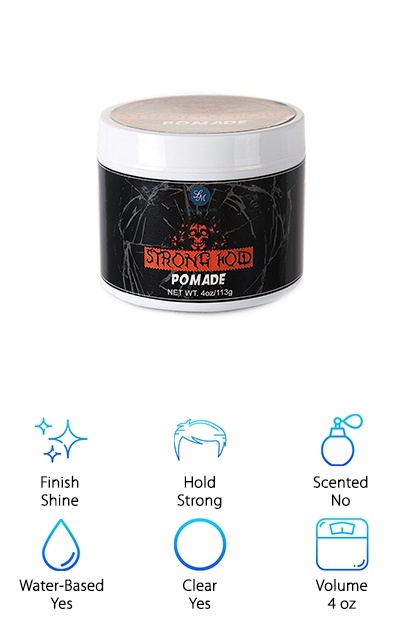 This pomade from Hair Craft Co is our best medium shine pomade Technically, it’s “semi-matte” but that really just means that it doesn’t have high shine or a matte finish. You’ll only need to apply this once during the day and you’re set. Run your fingers through your hair throughout the day to reset it if you want a change. When you’re done, just rinse it out. It doesn’t leave behind any residue. No matter what kind of hair you have, this one will do the trick. Long, short. Straight, curly. Think, thick. This pomade is equally effective on all of them. And that’s not all, you get a large 4 oz jar with this purchase, too, whereas some of the other brands only give you 2 oz. You’ll love the textured look of this pomade. This matte, no shine pomade might be the best pomade for short hair. While it works on long and medium styles, too, it looks really good with short hair because there’s no shine. This one has a lot of control to it and can hold the shapes that you want to create with your short hair. The clean smell is subtle, but it’s definitely there. 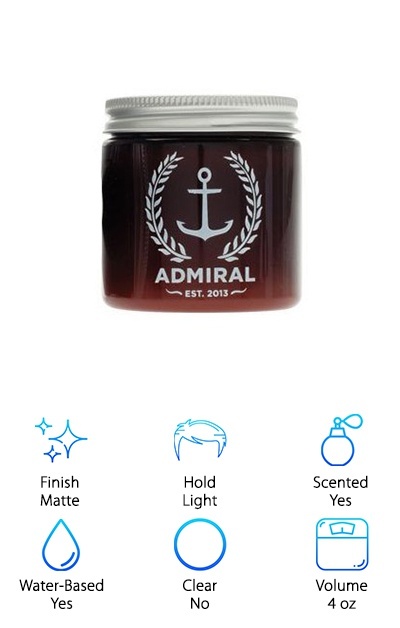 You won’t smell it in your hair, though, only when it’s in the container and during application. Get this: not only do you get strong, all day hold but it’s so easy to rinse out of your hair. In fact, you don’t even need to use shampoo since it’s a water-soluble product. This container to this is a nice size, too, perfect for traveling or sticking in your gym bag. 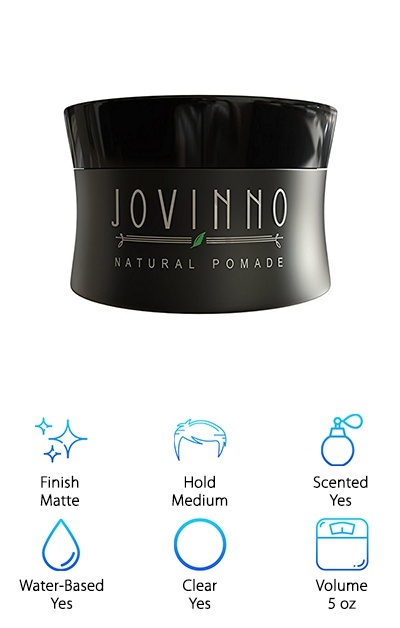 What’s most intriguing about this thick hair pomade is that Jovinno sources most of their ingredients straight from France. Plus, they only use the finest quality natural ingredients to help nourish your hair. The texture of this pomade is really nice, too, it’s smooth and silky without any stickiness. You get a pretty good medium to firm hold while also keeping a more natural matte look. Put this in your hair in the morning and you’ll be good to leave it all day. Or, restyle and quickly adjust your look throughout the day just by running your fingers through it. This pomade is water-soluble and can easily be washed out of your hair with no need for shampoo. They don’t use any harsh chemicals, either, which means this pomade helps keep your hair smooth and healthy without drying it out. This best shine pomade is pretty versatile. Whether your hair is straight or curly or is you like it styled messy or neat, this paste will give you flexible hold. If you want less hold, apply it onto damp hair with a little extra water. Want more? Use a slightly larger amount. It works almost like hair gel except it doesn’t dry with that wet looking clumpy feel. 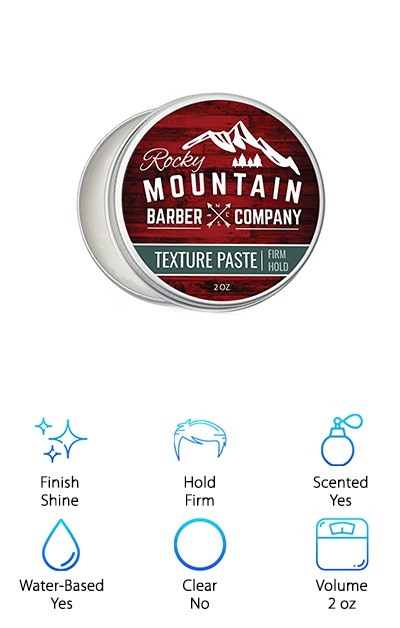 Something special about Rocky Mountain Barber Co. Paste is made in small batches. Why is that good? It lets them maintain higher quality control. Plus, the product you get is fresher than with mass-produced brand because this one wasn’t sitting around in a warehouse waiting to be sold. It’s made of natural and plant-based ingredients including beeswax and lanolin. These ingredients also give it a light, natural scent. All right, without further ado, let's get right to our top ten list! Lagunamoon’s pomade has a strong hold that can get your hair into almost any style you can imagine. This pomade works on any hair texture and thickness and gives your final look a nice, polished shine. Plus, it’s not greasy or oily and won’t clog your scalp. To get the strongest hold possible, comb it through dry hair and style as desired. But get this: if you change your mind about your style later in the day, don’t worry. All you have to do is add a bit of water to reactivate the pomade and you can restyle it. You can go to work looking professional then loosen your style up a bit at the end of the day for happy hour. Plus, it’s easy to wash out because you don’t even need to use shampoo! For a really versatile product, check out Mister Pompadour Beeswax Paste. It’s made of all natural ingredients including beeswax which is one of the ingredients that helps give you the hold you’re after. 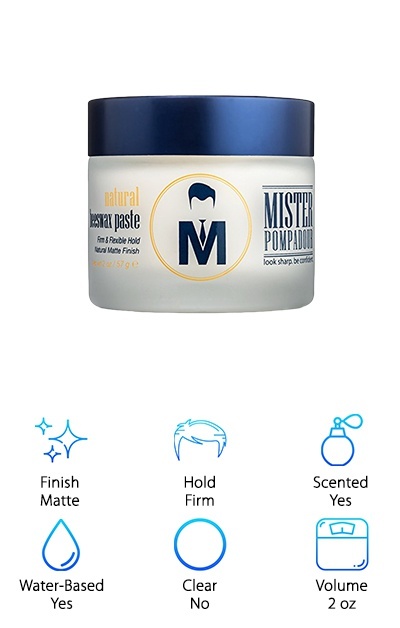 It doesn’t matter if you want your hair spiky, smooth, messy, or combed, Mister Pompadour will work. 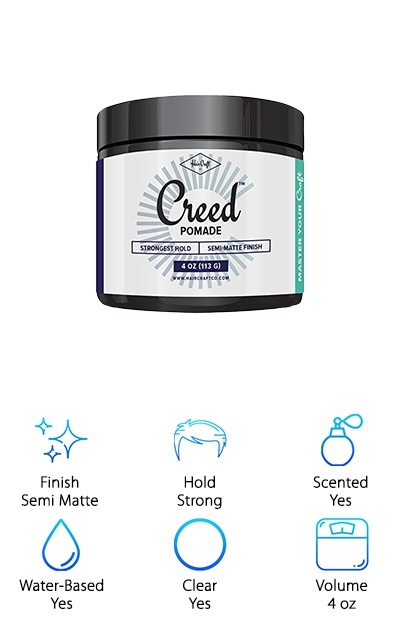 It keeps your style in place really well and here’s the best part: it’s not greasy or stiff at all. Plus, the beeswax gives it a really nice matte finish that helps keeps your hair from looking shiny. There are no parabens or alcohol so you don’t have to worry about it causing any damage to your hair either. This paste is made with care in small batches using only the best natural ingredients. That means better quality control and a fresher product for you. Hair Slammer Pomade from SSANAI is a high shine, firm hold pomade that works with any kind of hair. It doesn’t matter if your hair is long or short, curly or straight, this pomade will be able to get you the style you’re looking for. How does it work? Not only does It keep the hair sculpted and shapes, it also enhances the texture, giving your look more depth and personality. This pomade is water soluble and easily washes out of your hair without using any soap or shampoo. Natural bee’s wax is the main ingredient so there’s no risk of skin irritation. The beeswax and all the other natural ingredients are sourced in Australia. SSANAI is always looking for ways to eliminate chemicals and preservatives from their products and to use as many natural ingredients as possible.